The new hotness is cloud storage. So so hot. First, price. Prices from public web pages, rounded to the dollar. You'll see that Google Drive and Microsoft SkyDrive are fairly similar. Next is Sugar Sync, closely followed by DropBox. Then unbelievable expensive is Box. Well given price and the lack of desktop syncing nobody can use Box. 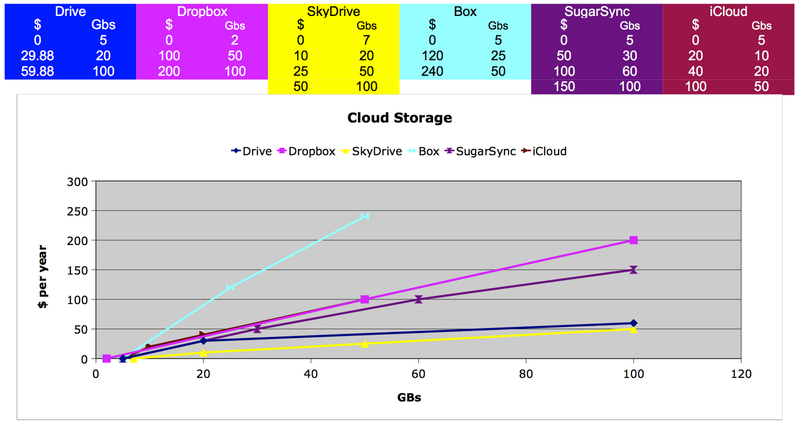 DropBox and iCloud pricing is so similar that either they are both using S3 (we know Dropbox does), or Apple have chosen Dropbox as their competitor for iCloud. Dropbox: Well I've used DropBox for a while. Dont trust them of course, but you cannot deny their ubiquity and LAN syncing is extremely useful. I _do_ store confidential data with them, but only ater applying a layer of encFS / FUSE. Google Drive: the new kid on the block, uses the underlying Google storage mechanism for sharing very very nicely. When we get the iOS client it'll be nearly as good as Dropbox in ubiquity. I also use encFS / FUSE here as well. SkyDrive: Microsoft's offering. The desktop client is nice on OSX, syncs quickly. Can also use encFS / FUSE, OK lets face it, trust no-one. The main weakness is the web interface, and of course the web interface cannot upload very large files. Oh yeah no Android client, so thats a huge heap of mobile they are missing out on. Box: no desktop client, insanely expensive. Enough said. SugarSync: its ok actually very similar to Dropbox in ubiquity and pricing. I've not used it as much as Dropbox maybe thats only because I got started with Dropbox first. Where do they store their your data? Security certifications? Use encFS / FUSE here as well. iCloud: For Apple ecosystem devices the ubiquity of OSX to iOS syncing is superb, and there's no reason to not use iCloud for your Apple devices. But if you are not heavily invested in Apple, or you need more storage, the iCloud is not so compelling. SugarSync 7.5 nice client, not quite as ubiquitous as Dropbox, security and privacy? Excellent article by TheVerge comparing these services. Box give 50GB for free with almost trivial effort to get it. True, but if as Microsoft say the huge majority of people have less than 7GB in SkyDrive, and thats representative of cloud storage users in general, then offering 50GB doesn't really change the game. Box has interesting integrations with things like Google Apps, even so, lack of desktop client is a deal breaker. I've tried it, and its too hard to use. MacFUSE successor: OSXFUSE or FUSE4X?